The Paul L. Cejas School of Architecture Building is the primary location for the Architecture, Interior Architecture, and Landscape Architecture programs. This is a state-of-the-art facility designed by renowned architect Bernard Tschumi specifically to meet the needs of the School of Architecture. It contains pre-graduate and graduate studios, over twelve critique rooms, a 150-seat lecture hall, lecture classrooms, a reading room, a shop, an interior design resource library, a digital fabrication laboratory, a dedicated gallery, and faculty and staff offices. This unique venue is a combination of five buildings of different heights interconnected with walkways and bridges that together offer 102,000 square feet of state-of-the-art classroom, studio, gallery, workshop and office space. The buildings open up to a central courtyard that the architect hopes will foster interaction among students and the faculty. The Paul L. Cejas School of Architecture Building is the main learning center for architecture, interior architecture, and landscape architecture students. It is named after Paul L. Cejas, the former U.S. Ambassador to Belgium and longtime supporter of the College of Communication, Architecture + The Arts. Years ago, Paul L. Cejas, as a member of the state Board of Regents, championed the creation of the school and later made a significant philanthropic gift to FIU totaling $2 million in support of the School of Architecture. Located at the Modesto Maidique Campus (MMC), the building named after him is designed by renowned Swiss architect Bernard Tschumi. The studios are open studios where graduate and undergraduate architecture, interior architecture, and landscape architecture studios share the same large open spaces. Each student has their own desk in the studio, with 24-hour access to studio and desk during the entire semester. The desk contains a storage cabinet, provides electrical and Internet access, and has both a work and display surface. Providing each student with a dedicated work space among their peers mimics an office setting where designers have access to tools enabling information gathering, idea generation, representation, and effective communication. The studios are lined with critique rooms to which each studio instructor has access for pin-ups and seminar meetings. These rooms are equipped with flat screens for video and digital presentations. These are a valuable resource and support studio class discussions, lectures, plus, final and mid juries. WELCOME TO THE FIU SOA DIGITAL LAB! The FIU SOA Digital Lab offers students and faculty in the Departments of Architecture, Interior Architecture, and Landscape Architecture the capacity to explore various modes of computer-aided reproduction and representation in both two- and three-dimensions. 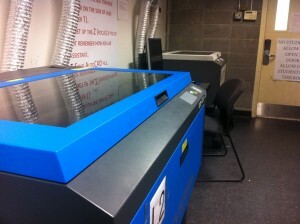 The Digital Lab features a range of two-dimensional printers from simple sheet-feed Laserjets to wide-format roll-feed Canon plotters. Three laser cutters offer an opportunity to quickly produce surface studies or two-dimensional parts for models and assemblies. Four Makerbot replicators provide ample opportunity for rapid prototyping and formal exploration. Welcome to the FIU SOA FABRICATION LAB! The FIU SOA Fabrication Lab offers students and faculty in the Departments of Architecture, Interior Architecture, and Landscape Architecture the opportunity and the facility to experiment and explore design ideas at multiple scales. We believe that designs developed in the studio and knowledge acquired in the classroom can be more fully synthesized when students engage directly with materials and building. Our design pedagogy actively promotes a culture of making through physical modeling, material testing, full-scale mock-ups, advanced fabrication techniques, prototyping, and installations. The Fabrication Lab features a diverse range of equipment from simple traditional tools to cutting-edge computer controlled milling machines. We consider our Lab space a flexible tool that is continuously reorganized and modified to fit our evolving educational and research agendas. 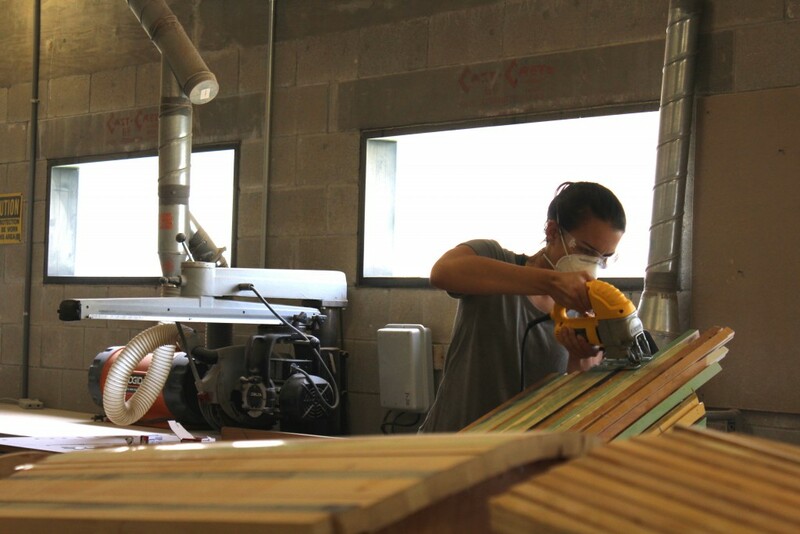 The Fabrication Lab is managed by Julia Sarduy, a designer and carpenter with a broad range of experience with multiple materials and fabrication methods. Our staff of highly trained student Lab Technicians is available to monitor safety and to provide assistance and training. The foundation of our Lab is a full cabinet shop featuring a 10” Sawstop table saw, a Delta 10” table saw and router table, a Jet 20” band saw with 12” throat, two 14” band saws, a Delta 14” radial arm saw, a 12” and an 8” compound miter saw, a Delta 8” joiner, 14” planer, 24” Jet drum sander, 36” edge sander, spindle sander, a Powermatic mortising machine, a Delta 36” wood lathe, and numerous hand and power tools. The Techno LC-Series 4896 is the digital workhorse in the Fabrication Lab. It allows a work area of 4’x8’ with an 11” throat and spindle speeds up to 18,000 rpm. Typical materials range from wood, MDF, and plywood to foam, plastics, and aluminum. The 2-1/2 axis Techno LC-series allows positive curvature three-dimensional surface milling as well as two-dimensional profile cutting, drilling, and pocketing. All of our Lab Technicians are advanced Rhino and Maya modelers who are fully trained in the use of MasterCAM and RhinoCAM to offer a variety of tool path solutions. Our newest Lab addition is a 48”x48” Belovac C-class Vacuum Forming machine with a 42” effective work area and 22” depth of draw. For use with plastics up to 1/4”, the Belovac allows us to take three-dimensional male or female molds made using the CNC mill or manual processes and use them to make thin compound curved and folded surfaces. Our metal shop features a range of sheet metal tools including a 36” guillotine sheer, throatless sheer, 42” box and pan break, rotary punch and die, 30” roll former, wheel crimp, and a 10” throat spot welder. We also have a 24” thread cutting lathe, a reciprocating mill, a 280 amp Miller stick SMAW process welder, and a Lincoln wire feed welder for gasless FCAW process welding. Numerous hand and power tools supplement this well-equipped shop. Our concrete lab is used for advanced material research in concrete and cementitious products. It includes numerous hand and power tools as well as a vertical shaft mixer and precision calibrated measuring devices for highly accurate mixture ratios used in concrete strength testing. Through a partnership with the College of Engineering and Computing, our advanced students and research assistants have access to precision tools for strength testing concrete and other cementitious products. Remember to wear close-toed shoes (no sandals, flip-flops, or high heels). Summer access to the model shop is by appointment only. Please contact Julia Sarduy (jmsarduy@fiu.edu). The Florida International University Structural and Environmental Technologies Lab (SET Lab) (PCA 131) is an interdisciplinary facility dedicated to teaching and research in building science and technology with a focus on ecology and the importance of climate responsive and energy-conscious design and construction.  The SET Lab serves the curricular needs of FIU’s Architecture Program by providing a dedicated space and equipment for learning through research, testing, and investigation of materials and systems for resource-efficient built environments. The College of Communication, Architecture + The Arts’ Miami Beach Urban Studios (MBUS) offers undergraduate and graduate students a unique opportunity to study in one of the most vibrant, artistic urban centers in the world for one semester, while gaining valuable professional experience at design firms, and by working with innovative public, private, and non-profit arts organizations throughout the city. The Miami Beach Urban Studio is a unique facility located at the corner of Lincoln Rd and Washington Ave in the heart of Miami’s famous South Beach. The facility houses College of Communication, Architecture + The Arts’ Galleries, offices, and School of Architecture studios and classrooms. Serving as a gateway to the dynamic urban environment of South Beach, the facility affords the Interior Architecture Department the opportunity to explore design in context that houses a variety of very interesting design examples and situations. Thanks to a major donation from Paul L. Cejas, the College recently opened the Miami Beach Urban Studios as a satellite studio space located on the corner of Lincoln Road and Washington Avenue in South Beach. The MBUS studios house 75 students and provide gallery, classroom spaces, and faculty offices for the studios located at this distinct facility. The MBUS provides an extraordinary base, located within one of Miami’s largest concentrations of galleries, music and theatre venues, architecture firms, and artist studios. Lincoln Road and the city of Miami Beach offer a diverse and rich urban experience for Interior Architecture students. Situated two blocks from the Frank Gehry’s New World Symphony, a short walk from the Wolfsonian Museum, the Bass Museum, and other cultural arts venues, students at MBUS have access to a truly immersive experience in arts and culture. Additionally, students at MBUS can take advantage of Miami Beach’s tropical landscapes and beaches, which are two blocks away. The College also makes this space available for events and workshops. Find out more at mbus.fiu.edu. The Robotics and Digital Fabrication Laboratory (RDF) is a state-of-the-art facility with robotic arms, 3D scanners, laser cutters, programmable objects, and 3D printers. The lab offers unique technology solutions for design, testing, prototyping, and fabrication. RDF is an extension of FIU’s Integrated Computer Augmented Virtual Environment (I-CAVE), which is a fully immersive and interactive facility. These facilities are designed to support diverse and innovative ways of using high end visualization equipment for digital fabrication as well as advancing fabrication technologies and tools through visualization. View more information on the RDF Lab Website.